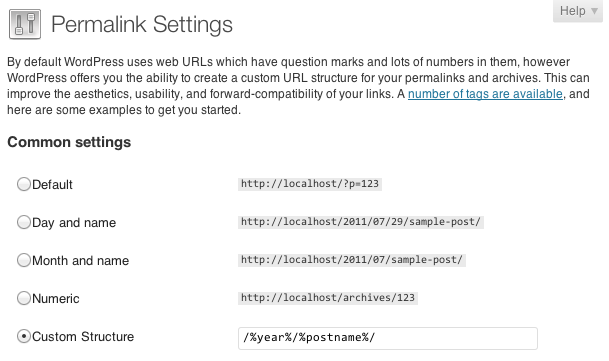 Go to Settings → Permalinks panel (Options → Permalinks before WordPress 2.5), you can choose one of the “common” structures or enter your own in the “Custom structure” field using the structure tags. Please note: Do not ever put your site url in the permalinks slot. You must use one of the structure tags, or a combination of tags only. Using the mod_rewrite: “Pretty Permalinks” structure is good for Search Engine Optimization (SEO) and I personally use the same. So, let us look at how to set that up. is the best custom permalink structure for SEO purposes. This is a bit of resource consuming structure, but works really well for SEO. Go ahead and enter this in the “Custom Structure” field. Important Note: You will have to enter the below rewrite code in your .htaccess file (Apache servers only) – This is already included for WordPress versions above 3.0. Well, that is it! You have successfully made your site’s URL “pretty” and search-engine friendly.